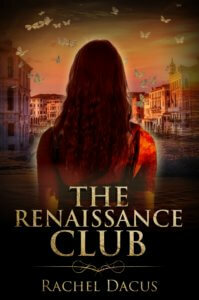 The evolution of a cover design for my novel The Renaissance Club has been a fascinating process. I’m thrilled with this cover art, showing my main character walking into a mysterious, dreamlike Italian Renaissance landscape. The scene shimmers with possibility, like the doorway in time through which she walks to meet her 17th century artist hero, sculptor Gianlorenzo Bernini. The process of working with my publisher on cover art began with words. I filled out a form about cover ideas and how themes in the book might be expressed visually, as well as physical descriptions of the main characters. Having never undergone a process like this with a publisher — cover art for poetry is more a matter of the author bringing an image to the publisher — I was intrigued. Then long months of waiting and wondering, at the end of which I received three different concepts. I liked them all, but felt that seeing the face of my main character was too specific. Fiery Seas’ designer them came up with this beautiful image of my heroine May Gold seen from behind, as she’s poised to move through the landscape of the Italian Renaissance, both contemporary and past. After seeing this wonderful evocation, I asked for just a tweak or two, and this gorgeous design became my novel’s cover. I love the way the feeling of time-travel is embodied in the changing light, from the dark below into what seems like a dawn sky. Transitional times of day make time travel seem possible. The butterflies that hover around her signify this transition, as do elephants. 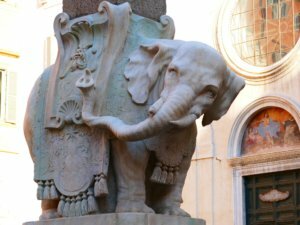 In the book, Bernini says elephants and butterflies are images of eternity. Thank you, Fiery Seas Publishing! Publication date – January 16! Not only do I have his beautiful new cover revealed today, but I also got a specific publication date. On January 16, you’ll be able to purchase The Renaissance Club. Having worked on this story for more than seven years, this is a beyond thrilling moment. Stay tuned for details about ordering.